I will admit that I sometimes need a little more caffeine than is probably recommended to get me through the day. 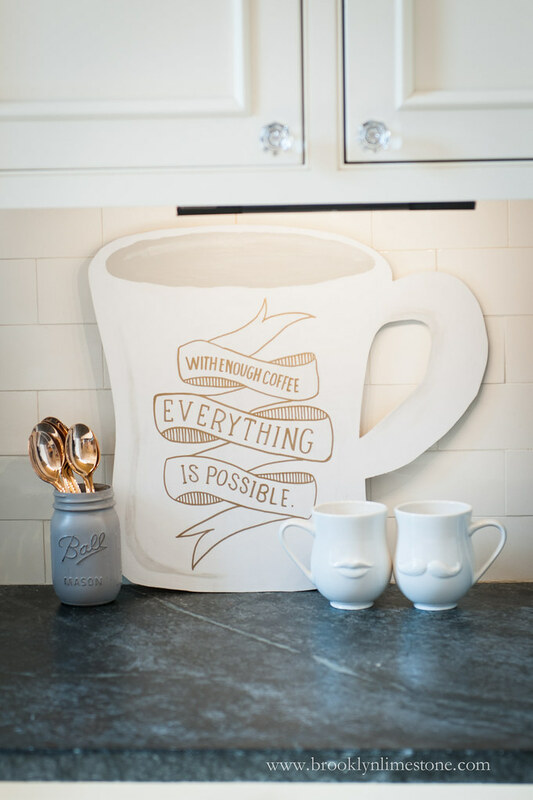 So okay, perhaps EVERYTHING isn't possible but starting my day with a little pep talk over a cup of joe seemed like a good idea. Bonus: it hides the ugly outlet in my backsplash. This was a super easy, fun project that I knocked out in a couple of hours with materials I had in the house. 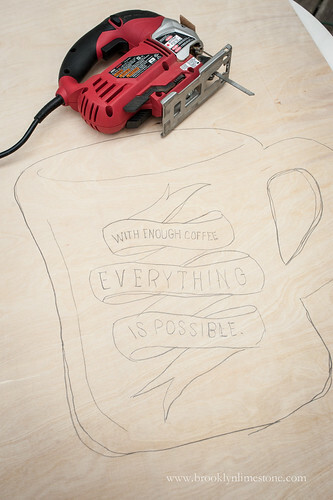 I started with a scrap piece of 1/4 inch plywood but you could certainly use something thicker. I drew out my design with a pencil (and did a lot of erasing) until it looked suitably like a cup. I wanted something that looked like it might have been found in a thrift shop so perfection was not the goal. Using jigsaw, I cut out the cup shape and lightly sanded the edges. 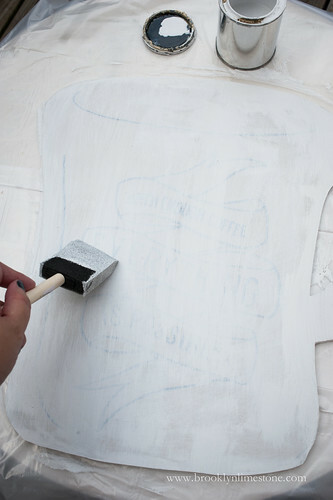 I drew over the pencil marks with a marker knowing it would show through a light coat of the white paint. 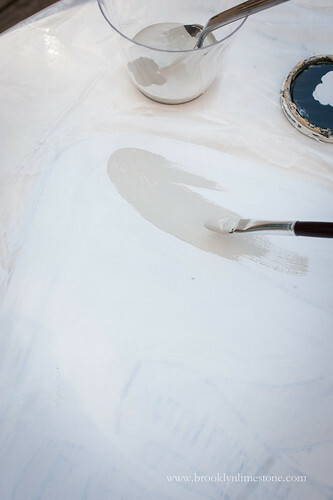 After a quick white wash, I added some "coffee" and shading using a beige paint. Finally, I used a gold sharpie to retrace the faint marks to make the final markings on the cup. Done! oh my goodness yes yes yes! oh i want to be able to type emojis here so badly because it makes me feel all the feels! So cute! And I love the his and her mugs. Where did those little beauties come from? Very cute and very true! Also would love those his and hers mugs! Where from please? They were a lovely gift - The cups are sold by Jonathan Adler. Those coffee mugs would go perfectly with the apple coffee cake. Also, I added nuts to the recipe and the cake was very good. Thanks Stef. Man, I love your kitchen. 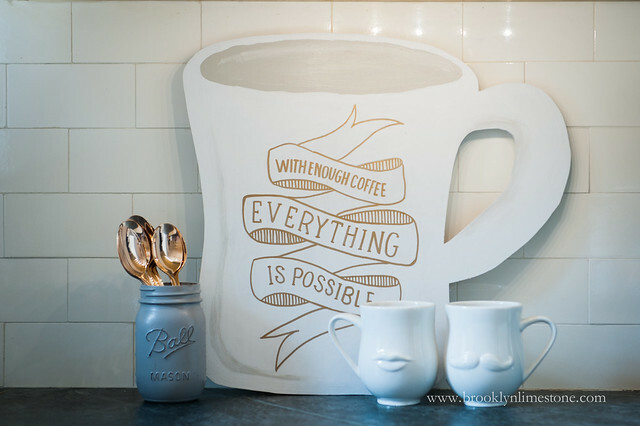 I would die to redo my cheap Ikea kitchen, but, alas, not quite in the budget :) Love the sign! You have such great vision. Great DIY. 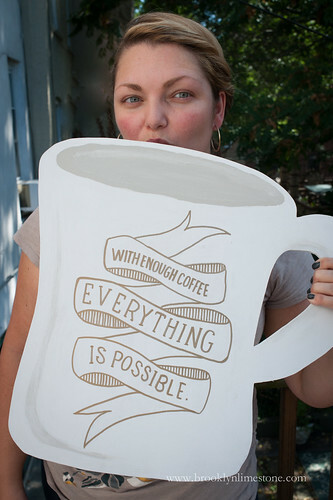 I have to make this for my coffee shop.